To prove that the Netherlands don’t get streets perfect, a traffic cop was waiting at these lights ticketing drivers and cyclists, but also telling pedestrians off for crossing empty streets against the red man — it’s the law here, bizarrely. On the launch of the UN decade of action on road safety (which I wrote about here), Kim Harding questioned the choice of frontmen for the campaign: a pair of racing drivers with numerous convictions for driving offences. Exploring further the British method of treating bad driving with driving license “endorsements and penalty points”, Kim noted a news article claiming that hundreds of motorists were still on the road despite having more than the magic number of 12 penalty points on their license. It turns out that a motorist only needs to go before a judge to cry that a driving ban would cause “exceptional hardship” and the judge will happily discard everybody else’s right to safety in their streets in favour of a proven bad driver’s right to carry on driving. Initially I was outraged. Who are these people? Why isn’t there a national register so that I can find out if my neighbourhood is safe? Aren’t they even banned from going near schools? Won’t anyone please think of the children? But then I remembered that I don’t actually really know anything about penalty points, not having ever bothered to acquire the necessary paperwork to start collecting them myself. I vaguely knew that 12 was the magic number that triggered a ban, but never had any reason to find out, for example, that it is only 12 points in a three year period that triggers an automatic ban. But, Wikipedia tells me, points remain as a stain on your license for at least four years before “expiring” — more for the really serious kinds of dangerous driving. So, given the system that we have, it’s actually perfectly possible to accumulate more than 12 points in, say, a four year period, without triggering the automatic ban. I’m not saying the system is morally right, only that the existence of people allowed to drive despite having more than 12 points is not, if Wikipedia is correct, evidence of judges letting dangerous drivers free on the streets. What is evidence of that is the FOI that reader Amoeba published in the comments on Kim’s piece. In addition to the many thousands of people still driving despite having more than twelve points, fourteen are still on the road with 25 or more points — something that it really is impossible to do without triggering the automatic ban and having to cry to a judge. Some people are on the roads with up to 36 active points. The least awful thing that these people could be doing is driving without insurance (6-8pts), repeatedly getting caught for it, but being allowed to carry on. The next least awful thing is that they are nicking other people’s cars — at least three of them — driving them very cautiously, and then torching them (thus making the theft count as “aggravated”) somewhere safe (3-11pts). I’m sure that happens, right? And a judge would let a repeat car thief carry on driving, right? Alternatively, and I guess most likely, people have committed thirteen (or more) “minor” offences (2-3pts) in four years — speeding, jumping lights or otherwise disregarding the instructions, driving a poorly maintained vehicle, driving without glasses if required, etc. (Of course, multiple instances of some of these could apply in a single go — e.g. four bald tires and faulty brakes would make a nice stack of points all in one go.) This means that they have triggered an automatic ban probably eight or more times and every time they have gone begging to a judge and every time the judge has bought their story. Which really does raise the question of what the points system is for if we don’t actually think people who have been caught driving badly and putting lives in danger thirteen times in four years need to be removed from the roads. The points system already has massive generosity and forgiveness built into it. The system gives you not just a second chance but a third and a fourth. Apparently you can cry to a judge and get an infinite number of chances. The worst option is that people have committed three or more of the worst offences — the 11 pointers: vehicular murder or manslaughter, causing death by dangerous driving, motor racing on public roads, drink driving, and so on. Offences that normally carry an automatic ban regardless of the totting up of points. And having done this thrice, the judge has decided that it’s fine for you to carry on driving. I hope it’s not that last one, but then, none of the options reflect very well on any of the people involved. If you’re angry about the injustice of how we deal with death on the streets, come along to Street Talks at the Yorkshire Grey, Theobalds Road, London, Tomorrow, Tues 5th, at 7ish for a talk by Amy Aeron-Thomas from RoadPeace. I’m just off the Deerstalker, having spent a few days trying out the new second-hand-but-unused Dawes Galaxy on the hills. Thanks to the generosity of the Scottish taxpayers the long-distance train ride back, with bed in comfortable single-occupancy cabin and breakfast tea in a spacious lounge and lots of bicycle space, cost £19 when booked several weeks in advance. One side of the political spectrum would argue that we should allow the sleeper trains to “fail”: that subsidy is an indication that the business model has failed and the business should go with it. That there is no place for services that don’t make money. Outside Look Mum No Hands, two vans are parked in the bus stop: V185 OUG and a “tree management” van FY59 VDT (using his hazards exempts). Opposite, another van, S619 BTC is parked on the pavement and pedestrian-crossing table and straddling double-yellows at the Domingo Street junction, delivering a package to Sandwich Box. No, that van has now been replaced by Cafe Deli Wholesale YF59 YTY, parked in the same place and using his hazards exempts. He’s delivering bottled drinks to… Look Mum No Hands. Printflow van EX60 KKE has driven up and along the pavement in order to get past on the narrow street. Four plain white vans, including DK05 WOD, are driven past on Old Street by people using handheld mobile phones. A City Sprint driver is on his phone, a Kier van driver looks like he’s texting. I’ve lost count of the number of private cars driven by people using their phones. Interestingly, a Mitsubishi Barbarian(!) driver is texting, a Mitsubishi Warrior driver is on the phone, and a Mitsubishi Shogun driver is drinking from a thermos. Mitsubishi pickup truck drivers almost overtake Range Rover drivers in the chart of law breakers, but the woman driving the black Range Rover W6 PSW with tinted windows scores an equaliser by using her hand-held mobile phone. A G-Wiz driver demonstrates that it’s just as easy driving electric cars while using your mobile phone. The driver of an empty minibus with a schoolbus sign on the back, KX56 BVW, is driving one handed while drinking; the Casa Flenghi van driver is reading his directions or itinerary while rolling through the heavy traffic; behind him, the driver of Clockwork logistics T6 CWK is more interested in watching LMNH and in his cigarette than on the road space he is driving into. The driver of a large JSM dump truck is taking big bites of his sandwich while closely overtaking a pack of cyclists at speed. A motorbike races down the queue for the lights by using the advisory bike lane, forcing cyclists to an emergency stop as he cuts in. A taxi follows, half on the pavement. Another taxi stops the traffic for a U-turn, neatly avoiding the bike stands as she mounts the pavement. Keltbray, GBN, Kilnbridge, McGrath, and countless other large skip lorries appear to have only the bare legal minimum of mirrors. Each time I look up, at least one in ten of the passing drivers is doing something at least dubious — careless, discourteous, dangerous — if not flagrantly illegal. They know they can get away with it. The police don’t have time to deal with traffic offenses, and they know that if they hit a pedestrian or cyclist, the CPS and judge will be sympathetic and understand the unfortunate fact that pedestrians and cyclists do tend to just come from nowhere. Many hundreds of cyclists have gone past. Just one rides (slowly, carefully) along the pavement opposite. I wonder why he doesn’t want to use his right to the road? Countless business models in our cities are based on moving goods around, and are borderline-profitable, relying on a mix of illegal and legal-but-immoral practices — speeding; parking in bus stops, bike lanes, buildouts, clearways and footways; red light running and no-entry ignoring; eating and phoning and fiddling with satnavs while on the move — to stay in the black. Others are very healthy businesses, using lawbreaking to boost their already ample profits just because they can. Businesses have built themselves into a dependency on bad driving and law breaking. Our cities could easily survive without the deliveries of bottled water and bagged ice cubes; with fewer disposable spoons and paper cups; with hotels doing their laundry in-house; with a few more parking places converted to loading bays; and with employers sacrificing a tiny little bit of profit to allow their delivery drivers the extra time they need to keep to the speed limit, park up to take calls, and walk the few extra yards from legal loading bays. We could even manage with fewer taxis — if they made fewer dangerous and illegal moves, they might not look so competitive compared to public transport or hire bikes. If the road rules were properly enforced, businesses would soon innovate; discover new and legal means of moving things around — or that things don’t really need to be moved around at all. And a few would fail — because they have invested too heavily in a business model that depends on breaking the law. And they would be replaced by something else — something unburdened by that investment. And that would be fine. We should stop propping up business models based on breaking the law. We should let those businesses fail, if necessary. My laptop has finished charging. In such a car-centric society as the UK it is politically naive to demand to take meaningful space away from cars. Millions of vote-toting motorists would scupper any such plans. The UK is in a different situation to Germany, Denmark, and the Netherlands, Carlton reminds us. We have Motorists, and they just won’t stand for any loss of road space. Instead of hard engineering, Reid proposes that there are other ways to overcome the traffic-barrier that stands in the way of mass bicycle use: soft behavioural and legal approaches. We should continue to educate drivers to play nicely, and keep up the campaign for strict liability, proper enforcement, and meaningful punishments. Because that has been working great so far. I mean, those campaigns are great and important and I’m totally on board. Those changes, if possible, would totally be an improvement. But if campaigning for good infrastructure is considered a naive waste of our time, how stupid are we going to look asking for strict liability? How long have drink-driving and mobile-phone use been illegal, and how long have governments been telling drivers of the dangers not to do those things? Look how fast those campaigns have progressed. They’ll be leaping out of lay-bys, dodging in and out of traffic, invading the motorways, going the wrong way round the M25 – the world’s their oyster, because they’ll be able to do no wrong. I wouldn’t put it past one or two of them to accidentally-on-purpose ride under a lorry just in order to claim the compensation. I agree with Reid that we will never get Philip Hammond to say “yes” to any of our proposals. But there’s a crucial difference between the law of the land and the priorities of planners: planning is not all in the hands of the man in Whitehall. Many of the people we need to influence are local, and many of them already consult cycling organisations on projects (often to be told that all cyclists like to ride like they’re on a motorbike). Bad luck if you live in the Tory provinces, but we have a mayor, an assembly, a regional transport department, an ongoing bicycle infrastructure project to argue about, and an election campaign to look forward to. And our electorate don’t have the same transport priorities as the rest of the nation. As we know, Boris has been quietly dropping policies that improve our transport and built environment by cutting private and business vehicle use. The already delayed Low Emission Zone, for example, has been pushed back another two years — so another two years of the smogs that cost the city millions of pounds and thousands of lives. All Newspapers reported the story that Brake are backing helmets for hire bikes – they’re essential, apparently. Indeed, Boris is terrified by people’s careless Borisbiking. As CycaLogical points out, though, All Newspapers overlooked the next part of Brake’s recommendations — that traffic be cut, speed be cut, and more routes be de-Motorised. Oona King thinks that cycling in London will take off only if we provide showers for “hot and sweaty” cyclists. No mention of the one issue that non-cyclists most consistently cite as putting them off: too much traffic too badly driven, and the lack of sane de-Motorised infrastructure. Car park fees at tube stations are to rise — a stealth fares hike says All Newspapers. Presumably, since there is no other way to get to a tube station, Motorists will just have to drive all the way to their final destination instead. And up and down the country local councils are continuing their War On The Motorist by considering raising parking fines. From the department of absurd transport “solutions”: the 155mph 23 seat business-class “superbus“. And the electric van fitted with sci-fi sound-effects, because people would obviously be unable to adapt to a world with quieter vehicles. Instead, how about a more stepped introduction to driving, with recently-passed Motorists kept off the roads after dark? The number of careless driving convictions is falling. Interpret this fact as evidence for anything you like. Cycling is cool — but not for professionals. Therefore professionals are not cool. Recall of Bentleys: the flying B mascot will impale the pedestrians that get hit by the cars, they found. Obviously, it’s fine to sell something that you know will kill people, it’s only the impaling bit that’s wrong. London Underground will be fined for flying flaps that slapped passengers on the platform. The proposal to give Waterloo Station (a “much altered and uncoordinated mix of styles”) listed building status has been rejected, leaving Network Rail free to mess about it with it. Brixton bus depot burned down. Apparently it was car-free day on Wednesday. Me neither. Railway first-aiders say they’re not allowed to give first-aid to passengers. 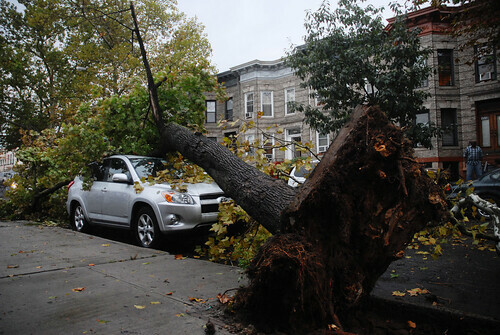 And your moment of zen, via flickr blog and flickr user Brunocerous: the sad sight of an old tree downed by storms in NYC. Those deeply unpopular and ineffective speed cameras whose only point was bleed dry the poor hard-done-by ordinary Motoring Brit? Switching them off has prompted an, er, popular backlash from ordinary Brits, after their roads filled with people driving like massive twats. Even the AA has realised that the anti-camera morons are not representative of their members. In Dorset they’re serious about their War On The Motorist: in the Poole suburb of Sandbanks, famous as home to spoilt sportsmen celebrities with Range Rovers, a quarter of all Motorists have been caught speeding within the past five years. Poole are even bucking the trend by installing those evil average-speed cameras on streets with schools. Shocking finding of investigative journalism, though: law entirely ineffective at punishing and reforming dangerous drivers. Allegedly, the tube strike led to a rise in cycling. I only saw an increase in inexperienced drivers on the road, but then, I live in South London where we don’t have tubes anyway. As the Tories criticise the unions for walking out on strike instead of being nice and getting around the table to talk about the ticket office closures, they, er, walk out of the London Assembly, refusing to debate the issue of ticket office closures. Candidates for mayor are firing up their politicking, with Boris stating disagreement with coalition transport cuts, and Ken promising to resurrect the never obviously useful Cross River Tram project. And desperate to make the Hire Bikes — and by association the one lone man solely responsible for their entire concept and implementation, Boris — look brilliant, the Standard now claim that “Boris Bikes” are inflating property prices around the docks. Meanwhile, the problems with the system mount up, as TfL automatically charge users’ credit cards hundreds of pounds each for non-existent usage. “Signalling irregularity” sent a Hammersmith & City train the wrong way down the tracks, weeks after the media mostly ignored the runaway Northern Line train. Councils are switching off their street lights to save money. Expect a rise in traffic accidents and violent crime and robbery — but that’s OK ‘cos the costs of those won’t be on the council’s books. Every tabloid hack knows that students these days are just taught how to pass exams, rather than the stuff they’ll need to know out in the real world. Turns out that this is just as true of learner drivers — but the authorities are trying to change that, starting with the removal of test routes from the internet. As Sustrans opens an alternative coast-to-coast route, the government is being asked to remember what a good investment proper cycling infrastructure is. The most entertaining reminder is Christian Wolmer’s epic letter to the Minister for Miscellaneous Non-Rail Non-Car Transport (or whatever his title is). Lambeth Palace has collided with a bus. Three-mile, £105 million motorway will provide “attractive gateway” to Port Talbot. Durham know that a weak “congestion charge” that’s in single figures — whether £2 or £9 — is never going to be effective. The only proven way to get cars off the streets is the destroy them. There’s a violent thief on SouthEastern trains. That was quick: the visit-all-docking-stations-in-a-day challenge has already been successfully completed. Tory councillors say stupid things about cycling and road danger shock. A Cincinnati woman is arrested for an “equipment violation“, while a Carlisle woman on the motorway does it the old fashioned way. The M42 was closed by a poorly horse. Ho ho. Florida man arrested for “arguing with bicycle“.